To Salford that is. E was back from London early, so a pint was in order. The Marble is getting too familiar for these post train trips and I just didn't fancy the Angel, so toting our passports we slipped across the Irwell to Salford. To the New Oxford. It's easy to find, set in a leafy square and is an attractive ex Vaux pub turned into a modern, airy and bright free house. A few familiar faces cluttered the place. On a round tall table, Eddie, the eager, legal beagle, stalwart drinking companion of Tyson, was holding court and a few well known tickers were propping the bar up. One or two CAMRA types purred contentedly. I checked - only one beard in the busy pub and he was a ticker. So there. The beer range was extensive and mostly pale. Eddie recommended the Dark Star Sunshine, but I was drawn like a moth to flame by that most enticing of breweries - Mallinsons - this time in the shape of Cascade. Now I have to say it wasn' t the finest Mallinsons eve r, but it did have decent bitterness though somehow it just didn't hold together as well as usual. I then took Eddie's advice, but disaster struck. E got her half. My pint spluttered to an end. It was off. I ordered two halves. 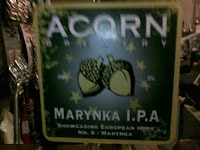 Acorn Marynka IPA. was pale, full bodied and had a spicy hoppiness that I liked a lot. What it wasn't was an IPA. 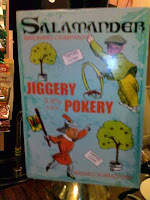 Salamander Jiggery Pokery was a straightforward pale, hoppy, does what is says on the tin golden ale. Both could have been necked all night, but driving ruled that out. E's recommended beer was excellent. Good call Eddie. The New Oxford is a modern decent pub with a great range of beers, both British and Foreign and as a bonus for Southern Softies, doesn't use sparklers. Ignore this obvious failing and go anyway. I don't have anything to say about this. It's all been said. In an interesting article here, the Times talks about how food and drinks companies are "caring and sharing" in the recession. It singles Harveys out as largely only selling its products within 60 miles of the brewery and its donation of its spent grain for cattle feed and fertiliser. “We have a symbiotic relationship with the local community,” explains the head brewer, Miles Jenner. “They are our bread and butter and we support them — it’s as simple as that.” Giving away waste saves money on disposal and lessens landfill. It makes sense all round. This is I think though, common practice. So to give a local angle to this, one of the farms at Tandle Hill collects spent grain for cattle feed from Lees. The trailer is parked outside daily and I've often seen it being filled when I pass by. This is a good thing and though I don't know if its all done for free, I suspect it is. I've no idea what would happen to it otherwise. Landfill as Miles Jenner says I suppose. Maybe I'll ask the farmer next time I see him in the pub? The photo is nicked from the web and shows Anderson Valley Brewing it seems. I'll replace it with a genuine Lees one asap. 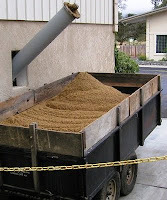 For those interested further, enter "spent grains" into a search engine and fill your boots. There's loads of (interesting) stuff about it. Heading to the GBBF? Fancy starting off with a calibrating pint of Keighley's finest, Timothy Taylor? So you head off to the Yorkshire Bar don't you? Er. No. There isn't one. Hmm. Maybe the North East Bar, though you kind of doubt it? Nope. Not there either. So where is it then? It's on the North West Bar, along with several other Yorkshire brews. "Never mind" you think, "While I'm here, I'll work my way through some of the Manchester Brews, I've always wanted to get Lees, Hydes and Robinson's on one bar" (now bear with me, I'm just illustrating a point). But they aren't there. Where could they be? Well they are on the Peak District Bar along with beers from that well known Peak District town, Southport. They've even moved Wigan there too for good measure. I haven't done the arithmetic - someone else has - but it seems 45% of the breweries on the Peak District bar are actually in the North West. The North West bar has 8 Yorkshire breweries out of 22 - therefore only 63% of "North West" breweries are actually in the North West with 37% being incorrectly located. Does any of this tosh actually matter? Probably not, but surely CAMRA could have come up with something more sensible in terms of naming? Of course if you add in all the beers at the fest, the issue is small, but really. Taylor's in the North West? Lees in the Peak District? I guess you need to ensure the bars are of equal size which I suppose is a management thing, but still doesn't feel right to me. Don't worry though, I understand that they are going to sort it out after next year when the banners need renewing. This is a slightly amended version of my original, as I quoted material from a private source. Apologies. Millstone Brewery isn't in a mill, it's in a converted laundry in Mossley, but an eager crew led by Stopwatch Sid gathered there on Thursday for an Oldham Beer Festival Winner award ceremony. It was good to listen to the enthusiastic owners and to sup some ale, though on this occasion, due to space restrictions, it was re-racked. Unfortunately the limitations of this style of presentation were evident in a lack of condition in what was otherwise very good beer. Afterwards we zoomed off to Stalybridge to the Railway Buffet. This is a great example of the "station bar" genre and it was busy too. We stood on the platform until it became too cold to do so and then enjoyed the bustling and cheery atmosphere inside until Sid called time. Beer of the night for me was Yorkshireman from Elland. Not golden this time, but distinctive and hoppy and brewed to celebrate Yorkshire Day*. You rarely get a beer from that lot that is anything other than good. A contrast on Saturday. In the time honoured manner, we met for a drink before going for a piss up in a brewery. Who else other than Brits would do that we pondered shamelessly? More Elland for me, this time Jollification and a decent pint too of Daleside Pride of England. Green Mill Brewery is underneath a snooker club in guess what? An old mill. Green Mill in fact. A f ather and son operation, the beers are brewed on a Dave Porter plant and pretty good they were too. I stuck mostly with Northern Lights, a light brown beer with a distinct hoppy finish, but others tore into Chief and Big Chief. Somehow I missed out on the Big Chief, but its slightly weaker sibling was a good beer too, with a lovely hoppy finish and good body. It was good to talk to the owners too, over an excellent barby in the brewery yard, on what turned out to be the only sunny day of the week. They are holding their heads above water and the beers are getting out and about too. They've also picked up the odd award, which pleases them greatly. Don't believe that these awards mean nothing to brewers. They do. It helps them sell beers and keeps them optimistic, though in my experience all brewers are optimists. And most are really nice guys too. Just two beers yesterday, both in the Marble Arch and both very good. First Oakham Inferno which was bitter, tasty and very drinkable, though maybe there was just a slight touch of wateriness. Then Thornbridge Kipling which was at first harsh and jaggy edged after the more delicate Inferno, but as you got into to it, a very enjoyable drink, though not a swigger. The Marble Manchester was pronounced as poor by her indoors. She switched to Inferno and purred happily over it. Manchester Bitter is usually very good. These things happen. "It would also be true to say that the beer list is not designed for us - and that’s fair enough as we can get easy access to the beers that do interest us. The list is produced for the beer drinker who wants a standard bitter somewhere between 4 and 4.4% and who is both the bane of the British brewer and the person without whom the British brewer would go under. While it is possible to run a brewery, record company, publisher, putting out nothing but cutting edge stuff, this is rare and exceptional, and most companies put out the standard fare that brings in the money, and then put out the non-profitable interesting stuff as a sideline. 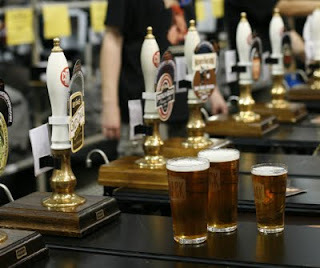 GBBF is for the common man - a beer festival of standard beers, and it appears to work very well doing that. It also manages to include a couple of bars, BSF and Wetherspoon, which cater for those who are looking for the non-standard or brand new. I don’t think that us beer geeks moaning on our internet forums and blogs that GBBF is not full of rare and splendid beers is going to make any difference - all it does it makes us look hostile and even more geeky and out of touch to the organisers when they do look at our forums. " I don't agree with every word, but broadly he is right. There is something for everyone and I would reckon that only the most geeky geek would find it difficult to find interesting drinks. The BSF list certainly ought to keep them quiet for an hour or two. I know lots of you will be there. I'll be serving at BSF as usual. Geek or not, come and say hello. The British Beer Blog scene is changing, so my blog list is too. 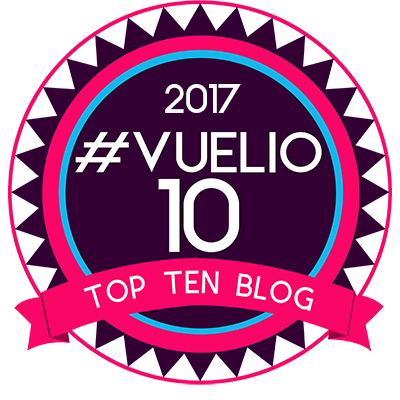 Bloggers come and bloggers go, so my links list will reflect this. Out goes A Good Beer Blog, Beer Buzzing and the Young CAMRA Collective as all are defunct in terms of updating. One or two more may join them for the same reason. It isn't personal, so do let me know if you intend to start up again or are just taking a break and I'll restore the link. Of course there is new stuff too. So welcome to my blog list to Barm, Brewer's Union, Cooking Lager and Leigh from Leeds. I don't usually link to Yankee bloggers unless I know them personally - there are just too many to read - but I make an exception for Brewer's Union 180. My American mates - well some of them - live in Oregon, I've been there and loved it and a cask ale pub in that great beer state is just such an interesting concept. If I've missed you out, just let me know. It wasn't intentional. Oh and is anyone having problems opening John's Random Ramblings? It now says "By invitation only". It pissed down as I passed by Lees' Lancashire Fold, so I popped in. It was just about 2 p.m. The Coronation St Ale was undrinkable, but the Bitter was in top form. On my daily walk today I noticed another pub closed and boarded. The Bricklayer's Arms wasn't (unless I am bloody blind) when I walked past late last week. 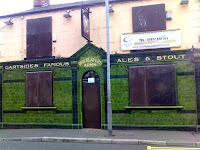 OK it was a bottom of the market dump with shite beer and sub prime customers, but the Gartsides (no apostrophe required) tiling reminds me of the possibility that it wasn't always so. Would it ever do better or even well enough in more capable hands? I doubt it somehow. Gartsides Brookside Brewery was in Ashton Under Lyne. The Southport Drinker and Jeff Bell both feature the current furore over pub closures. The argument seems to be "what constitutes a closure?". There are various ways of counting these things, but one aspect seems certain. The figures are being manipulated by those quoting them, to suit the side of the argument they wish to pursue. Absolute numbers we can rely on are hard to come by. Bloggers are working in the dark somewhat in commenting. In this area many pubs close and don't re-open. A few do, but usually not for long. Many are demolished. Almost all of these seem to me, anecdotally and observationally, to be at the bottom end of the market and won't be missed by many, but that may not be the case always and elsewhere. What I think we can say with a degree of confidence is that in most areas lots of pubs are closing forever. The devil, as always, is in the detail. Ron Pattinson for example has already pointed out that pub numbers have always fluctuated and were already at quite a high - so maybe this shake out is an inevitable market correction? I have always argued that good pubs will survive and bad ones won't. The offer always needs to reflect the market conditions and in so many cases it just doesn't. Of course I am not forgetting the PubCos whose role in this whole problem is at best unsavoury. These guys are a large contributing factor and illustrate yet another "unacceptable face of capitalism". There are quite a few knocking about at the moment. 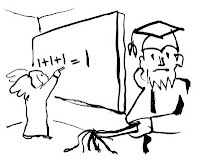 So to sum up, we just don't know exactly, but one other thing seems to be confirmed - the old adage that "there are lies, damned lies and statistics!" I have two brewery trips this week. Rather unusual to have two in a week, but it'll be a change. First on Thursday night a welcome return to Millstone, just out of our area in Mossley, where Lancashire, Yorkshire and Cheshire boundaries meet. Their beers are hoppily superb, their hospitality legendary and their enthusiasm for what they do infectious. On Saturday it's the much newer Green Mill in Rochdale. I haven't been there before, but I've largely enjoyed their beers, so look forward to trying them at their freshest. That's just two of the excellent breweries in Greater Manchester. Come to think of it, three of the best micros in the country are here. I'm talking about Pictish, Phoenix, and Marble. We really are blessed in Greater Manchester to have so many top notch breweries producing cutting edge, drinkable beer and of course, just across the wild frontier, there is West Yorkshire with even more good stuff from Mallinsons, Elland, Ossett and many more. We had the mob from the pub round on Saturday. 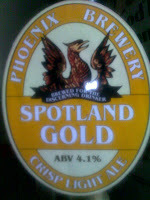 The beer of choice was Phoenix Spotland Gold, named after Rochdale FC's ground. This is a delightfully pale and hoppy beer which drinks really well. I'm glad I chose it. The only issue was in the preparation. Tony Allen, the brewer, always conditions his beer well to ensure a vigorous secondary fermentation. He'd certainly done it in spades this time. When I vented the beer, it went off like a rocket, soaking me and a fair bit of the garage in beer. Unusually I soft spiled it. No good. The beer just gushed through. It came through the hard spile a fair bit too, but when it had all stopped, the beer was ready and in fantastic condition. It went down well and the cask was soon drained. If you see any Phoenix beer near you, grab it. There isn't a bad one in the bunch. When I returned the cask, Tony was telling me he'd been on a six hour trail round Lewes with the Harvey's Head Brewer Miles Jenner and the Brewery History Society. He mentioned that the beer in the brewery was fantastic. 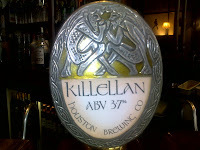 I had a pint of this in the Drum and Monkey in Glasgow. This was the pub run by three, shall we say, less than customer focused young women I mentioned here. I think they were all still there. Two of them were definitely, but really, I can't be certain. They all still seemed a bit ...... well .......glum. The spectacularly ice covered founts were disappointingly ice free. The pub was still under performing if the customer numbers were anything to go by and I'd describe the atmosphere as "subdued". And Morrisey Fox Proud of Pubs? Well a distinct Greene King IPA type sourish taste with a hint of Scottish Export within. Sweet and sour really. Fine if you like that sort of thing, but not exactly moreish. I had a Scotch pie in a well known English bakery chain round the corner before boarding my train. My first Scotch pie for over 8 months. I queued humbly with the suits, but the pie was nothing special - not enough white pepper in the recipe - still it takes me back 30 odd years and that made it worthwhile. Seems things are bad in the "Dear Green Place". This sign says it all. Having been up since four a.m. to catch the six thirty three to Glasgow, I was feeling thirsty when I got off the train at Glasgow Central. I took the short walk to Queen St Station with a view to nipping into the Counting House for a pint. 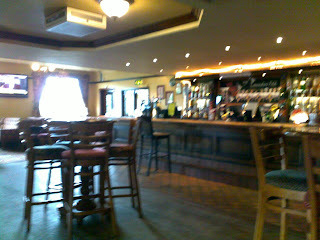 It was just before ten in the morning and a few were in, though no-one was at the bar. I should have been alerted by this, but wasn't. It's a fine big pub, an ex Bank of Scotland HQ with a load of grand features from a time when banks were built to impress. I ordered a pint of Rooster's Oakey Cream just to show I'm not entirely a stick in the mud - well OK because it was right in front of me. "Will you be having breakfast?" was the reply. "Er, no". I had been fed on the train. "Alas" quoth our fair maiden, "you can't be served alcohol until eleven." Seems the laws have changed. She said as they are designated a tourist zone, no alcohol is allowed without eating, until eleven and then, just two drinks are permitted. I have to say I was astonished. Scotland lead the charge towards UK licensing law liberation and now it seems, they are reversing the process. Another victory to the anti alcohol lobby? So I sat in George Square for half an hour watching the tourists - yes there were loads of them - and then walked the mile or so to Charing Cross, where my enforced drought was ended by two pints of easy drinking Killellan in a more or less deserted State Bar while reading the Glasgow Herald. 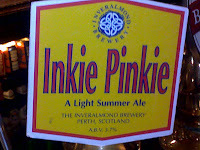 Just to be sure I was really enjoying things, I went to the Bon Accord too, where a very robustly hopped and bittered Inkie Pinkie from Inveralmond reminded me that water and lime is fine in its place, but is no subsitute for good old beer. I was told that the bitter was on excellent form today in our pub. My water and lime was just fine too. Two days to go and I'm enjoying not having any booze. I might not bother having a drink on Tuesday. After a pleasant visit to Phoenix Brewery on Saturday, along with a couple of others, Tony Allen, the brewer, suggested we nip into Heywood to check out the refurbished Engineer's Arms. My experience is that Sam's when they do a place up, do so sympathetically, to a high standard and restore as many original features as possible. The Engineer's was no exception. They have done a great job in this traditional local. Old Brewery Bitter will never be my favourite beer, but it was on good form too. 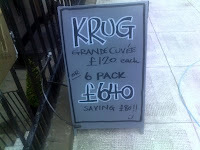 I won't mention the price though - that'd be cheap. Which it was. Heywood is known locally as Monkey Town. Not sure why. Thinking of making that long promised trip to the Oktoberfest? Well consider this. Visitors to Munich’s world-famous Oktoberfest will have to dig even deeper in their pockets this year, with prices set to climb up to €8.60 (£7.36) for a one-litre Maß. That's a hefty £4.80 a pint. If you fancy some water that'll sting you too, at €6.63 per litre. Don't even think of having a wheat beer unless your wallet is particularly stretchy. 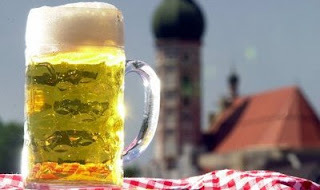 A litre of wheat beer will cost up to €13.60 this year. Oktoberfest starts September 19 and runs until October 4. I am grateful to The Local for the story and the photo. I have a root canal infection which is very painful. I'm just telling you for the sympathy really, though there is a side effect. From yesterday I won't be drinking any alcohol for ten days. The dentist warned me, the pharmacist warned me, the label on the antibiotics warns me, the leaflet in the box warns me. No alcohol. OK - got it. Yesterday I went to the pub as usual for the full afternoon session and drank an infeasible amount of water and lime. Why do drunks talk so loudly and what's so bloody funny anyway? It was touching to receive a personal invitation to the retirement luncheon for Giles Dennis, formerly Head Brewer of JW Lees. The great and the good of British Brewing were there, along with licensees, brewery colleagues, malt and hops suppliers, beer writers, friends and many others whom Giles had just wanted to be there. We started off with beer of course. As this was held in the new Crowne Plaza Hotel which Lees supply, a temporary bar was set up with Lees Bitter - reracked that morning - being liberally dispensed. It was good to chat to so many people from around the country, many of them ex brewers with funny tales to tell. If nothing else the brewing industry is full of funny anecdotes and delightful people. Lunch was steak and ale pie and beer, wine and speeches flowed. 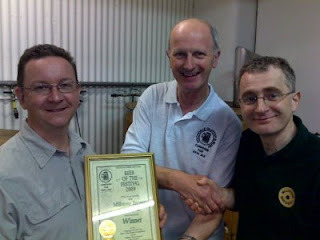 We presented Giles with an appropriate special award from our local CAMRA Branch and I was asked to speak on behalf of CAMRA, which despite several pints of bitter and glasses of Rothschild Pinot Noir, I managed to do. Giles in his response to the Chairman's kind remarks about him, included a very positive mention of CAMRA's role which is gratifying. It earned a round of applause from industry people who actually know what they are talking about. Our table included beer writers Barrie Pepper, Arthur Taylor, the British Brewing Insitute and Lees Head Cellarman and the Head of Technical Services. It was a good afternoon in good company. I didn't have much time for blogging in the latter part of last week. On Thursday, meeting up with fellow blogger the Beer Nut took me to central Manchester for a quick pint. We met at four and full of good intentions. Well I was anyway. It didn't work out that way and somehow I found myself on the last bus home at 23.20. We had good beer and bad beer. Disappointingly some of the beer was shockingly warm which I find frustrating. In this era of temperature controlled cellars, there really is no need for it. I didn't take notes though the BN did, so maybe he'll post something in detail. I will though mention our first pint for a specific reason. I wrote here about a very constructive note I received from a local brewer, agreeing that at times their beer wasn't striking a particularly high or consistent level. I was therefore pleased to try what the BN was already supping, Allgates Groundhop Day. It was just what was needed on a hot day. Hoppy, cool, good bodied and for me, probably, the best beer of the night. So well done Allgates. There is a footnote to this. I had meant to take the BN a bottle of Lees Moonaker as a present, but in my rush to meet him, forgot it. We agreed to meet up at the Marble Arch next morning while I was on the way to a retirement do and he was awaiting the arrival of Mrs BN. It was very wet and the BN was like a drowned rat. I had a brolly at least. Me and two mates, suited and booted for the "do", knocked at the door of the MA at regular intervals after its advertised opening hour of 11.30 came and went. The staff inside ignored us until we gave up. Bad show. If they were running late, surely they could just have opened the door and told us that?